This shot was taken in front of the Wanchai Computer Center—a big shopping mall devoted to selling computers and accessories. Taken with natural light, the blur emphasizes the frenetic buzz of the hawkers pushing broadband services. 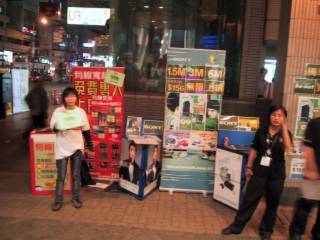 These street vendors could just as easily been selling apples or oranges, emphasizing the point to which broadband has become a commodity in Hong Kong. The right sign shows the various flavors available from one operator—1.5Mbps, 3Mbps or 6Mbps...almost two years later, I was only getting around 491 kbps down & 131 kbps up in the USA and paying US$ 30 a month; higher speeds were not available for a residential connection. At the time this photo was taken, a 1.5 Mbps plan was HK$ 156 (US$ 20) per month. See "Broadband as Commodity: Hong Kong, China Case Study" and the presentation at the ITU Promoting Broadband Workshop.